Theatre Centre empowers young leadership and youth activism through the arts. We invite young people to discuss and debate global and local issues, primarily through theatre productions, post-show debates, workshops, creative projects and resources. Our aim is to give young people space to own these issues for themselves, and encourage them to use their initiative to change things for the better. 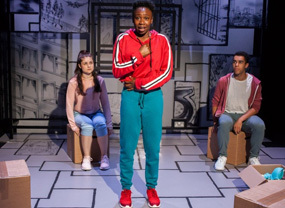 Our recent productions have discussed young people's experiences of violence ("What The Thunder Said" by Ed Harris), gangs and loyalty ("Advice for the Young at Heart" by Roy Williams), race, class and governmental responsibility ("The Day The Waters Came" by Lisa Evans), and humanity on the WW1 frontline ("The Muddy Choir" by Jesse Briton). Theatre Centre has worked with national and local venues and organisations including the South Bank Centre, Live Theatre Newcastle, Royal Exchange Manchester, the Durham Light Infantry Museum and Art Gallery, and Birkbeck University. 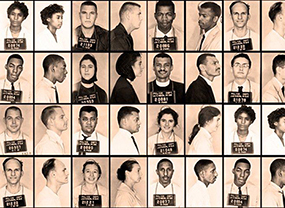 Our production for Autumn 2015 - "Rise Up" by Lisa Evans - tells the story of the Freedom Riders protesting illegal segregation across the Deep South of America, and offers audiences of today the chance to consider the injustices in their society which need challenging. Lisa's previous collaboration with Theatre Centre artistic director Natalie Wilson won the Writers' Guild of Great Britain Best Play for Young Audiences award in 2011.